People often ask, ‘What’s the difference between mentoring and…?’ Conversations starting from that question typically emphasise the distinctives of mentoring and separate it from, for example, coaching, or spiritual direction, or supervision, or counselling or whatever. But it’s a mistake to give the impression that there are clear, agreed boundaries between these disciplines or that mentoring is a completely different helping process. The fact is that all these helping approaches – and more – do share significant areas of overlap, especially when it comes to methodology. Furthermore, mentoring is carried out in many different ways. It does not always look the same. 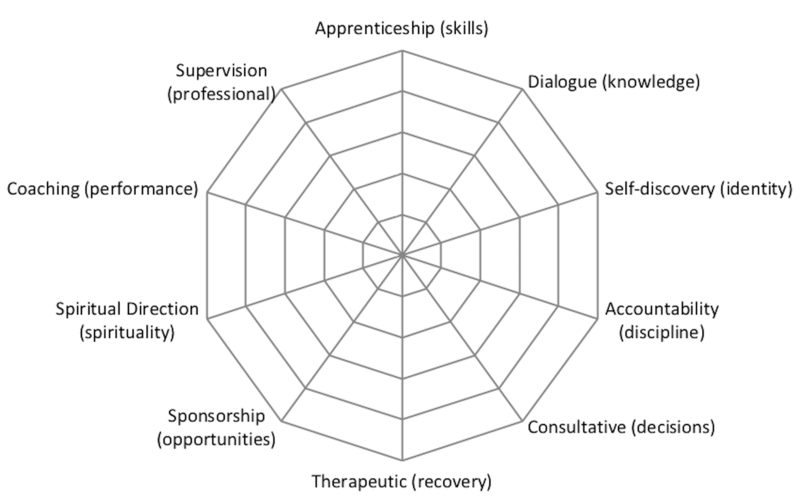 The specific shape of a mentoring partnership will vary according to the personal attributes of the mentor and the mentoree, the relational dynamic between them, the circumstances in which they find themselves, the impact of an organizational context, the areas for focus within mentoring, the desired outcomes, and other factors. When I am in conversation with someone about possibly commencing a mentoring partnership I would typically start by sharing my very general description of mentoring as ‘identifying and promoting the work of God’s Spirit in another’s life’. Once we’ve established that, it’s helpful to clarify in more specific terms both what the other person is looking for and what I am able to offer. Otherwise, we could have very different ideas in our minds about how that general description is applied and therefore have diverging expectations that could lead to frustration and disappointment. For this purpose I have developed a little tool by which I briefly describe ten common modes of mentoring and get some rough metrics about which of those modes fits with what they are looking for. I set out the ten modes on a radar diagram like the one below. Usually I’ll have it on a piece of paper and put it on a table between us so we can both write on it. Apprenticeship is for people starting out in a particular field of endeavour and are looking for someone to show them the ropes and practically demonstrate the necessary skills. Dialogue is for someone seeking to develop their knowledge of a topic or area of study and looking for a conversation partner to push their thi8nking to the next level. Self-discovery is for people who are wrestling with questions of identity and looking for someone who can help to clarify who they are, their gifts, abilities and potential. Accountability is for people who know what they want to do but also know they will struggle to remain true to their best intentions without someone to check in on the critical issues. Consultative mentoring is for people facing major decisions who require someone to help them consider the options from every angle so they can make well-informed choices. Therapeutic mentoring is for people rebuilding their lives after some difficulty. This mode is often helpful after the completion of a period of professional counselling. Sponsorship is for people seeking to develop fresh opportunities, expand their network and overcome relational barriers through connection with a trusted advocate. Spiritual direction can be a discipline in its own right. As a mode of mentoring it is for people focussing on spirituality and seeking a guide to develop spiritual practices. Coaching, too, is an established craft. It may also be a mode of mentoring in which a specific skill is honed with the aid of someone who knows how to promote peak performance. Supervision is for professionals seeking to pursue high standards with someone to help them reflect deeply on their practice and to inquire into possible blind spots. Then I ask the other person to rate each mode according to what they are looking for – less interested in a mode marked towards the centre; more interested marked towards the outer rim. No two people have exactly the same pattern. It’s an effective conversation starter and gives the mentor an opportunity to share their strengths so that both people can assess whether there is a good fit. Do you have some further insights on this? I’m currently developing a short questionnaire built around these ten modes to help with the metrics. It will have three questions per mode to help people assess if that’s what they are looking for in mentoring. If you have some suggestions I’d love to hear from you. Drop me a note in the comments section.